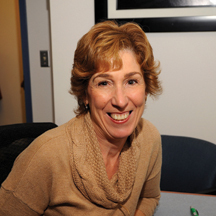 By Catherine M. Marino, Au.D. What is it like to hear all the sounds of life? Fantastic! Marvelous! If you have slowly begun to lose the ability to hear conversations and other important sounds that enrich your life, there is hope. Learning to hear again is possible through the care of a competent audiologist who customizes a hearing treatment plan using current advanced hearing aids as a tool to better hearing. Today’s technology not only can help restore those missing sounds but also employ an adaptive process for reintroducing them. This enables the auditory system to organize these sounds for maximum benefit and minimum annoyance. What Does it Take to Hear Again? As wonderful and dramatic as restored hearing is, the process of learning how to interpret and manage many lost sounds takes time, patience, and auditory training with the help of an attentive audiologist. Just as walking out into the bright sunshine after several hours in a dark movie “hurts” your eyes, so too does the sudden experience of re-hearing the many sounds of life overwhelm your ears and brain if they come at you all at once. While you would not stay in the dark just to stave off the insult to your eyes, why would you risk the negative consequence of staying in silence too long? Putting off getting hearing help not only delays your reconnection to the world through your hearing and ability to communicate, but it also impacts how well you can make use of the sounds you hear, once they are restored. Sensory deprivation is the reduction of environmental stimulation to one of our senses. In the case of auditory deprivation, it is prolonged reduction of sensory input to our ears, auditory nerve and hearing parts of our brain. Hearing loss reduces the transmission of sound through temporary blockage or damage to the outer, middle or inner ear and thus reduces the electrical signals sent along the hearing pathways to the brain. Another interesting fact is that the hearing pathways to the brain are arranged according to frequency much like the strings on a piano. Each fiber is dedicated to a specific frequency. So it is important to get immediate help even for hearing loss in a specific frequency range, such as a high frequency hearing loss. The introduction of amplification to restore hearing for those specific frequencies keeps all the fibers in good condition and may also help prevent or reduce tinnitus, which is an additional consequence of auditory deprivation. Following a comprehensive Audiological Evaluation, Listening Needs Assessment, and live Hearing Aid Demonstration, the audiologists at Riddle Hospital will offer a hearing treatment plan that is specifically designed for your individual needs and budget. 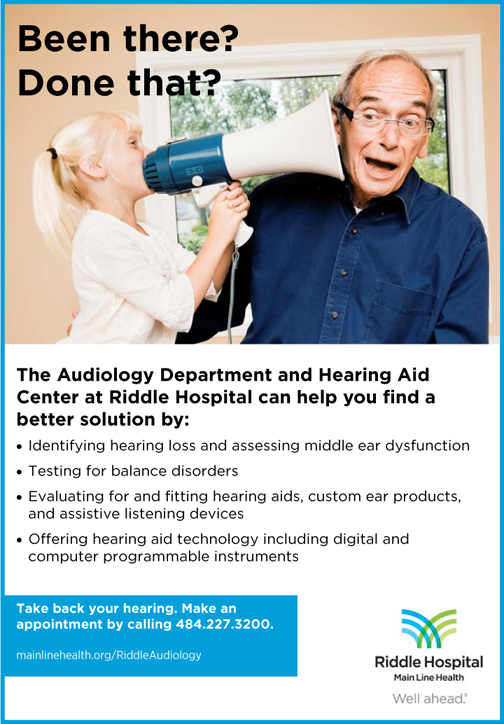 For more information or to schedule an evaluation or treatment, contact your physician for a referral to the audiologists at Riddle Hospital.